Online healthcare startup Medikoe, owned and operated by Vesaan Technologies Pvt Ltd, has raised $100,000 from Anil Menon, the CEO of CMS Computers. Medikoe, which offers its services only in Bangalore currently, will utilise the funds to expand to Mumbai and Delhi-NCR by the end of this year and to develop the next phase of products, its co-founder and CEO Sreevalsan Menon said. Medikoe is an integrated healthcare and wellness discovery as well as deals and review platform that connects consumers to hospitals, diagnostic centres, pharmacies and wellness facilities. In addition, it offers 5-30 per cent discount on integrated deals. Medikoe went live in October this year. It is available both online and as an Android mobile app. Founded by Sreevalsan Menon and Raman Shukla, it plans to expand to another 20 cities in seven states across the country next year. A month into operations, the company claims to have around 2000 users, 22,000 searches with each user spending approximately 8 minutes on its platform, browsing 7-8 pages. It further claims to have registered more than 1500 healthcare and wellness service partners, with more than 100 deals on its platform so far. The company works on multiple revenue models including selling ad spaces on the home and inside search pages to healthcare services, in addition to making money from preferential listing of services based on locations and charging services on a pay-per-click basis. 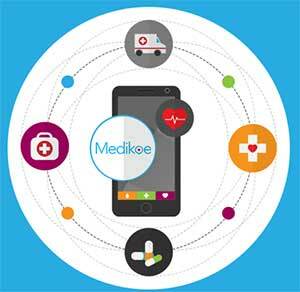 Medikoe also takes a commission from the service provider on every healthcare deal on the platform. Prior to founding Medikoe, Menon was the country manager for end point security and mobility at IBM. He has also worked with Mcafee, Ingram Micro India, and Citrix in the past. Shukla was regional sales director for MaaS360 by Fiberlink, an IBM company, before beginning his entrepreneurial journey. He has earlier worked with AirWatch, CSC, and Encora. "We at Medikoe ensure that every service delivered to our users is verified and trusted. With the help of this funding amount, we will expand across the country and associate with more than 6000 healthcare and wellness service providers," Menon said. While Medikoe attempts to offer an integrated healthcare experience by providing four major healthcare services such as hospitals, diagnostic centres, pharmacy and wellness, most other startups in this space allow users to book appointments. The most recent investment in the online healthcare space was in Medinfi Healthcare Pvt Ltd, a pure-play platform for searching doctors and hospitals, which raised Rs 1 crore ($150,000) in a fresh round of angel funding. In August, Practo Technologies Pvt Ltd, a web-based clinic management software developer and medicare listings provider, raised $90 million in Series C funding led by Chinese media and technology conglomerate Tencent Holdings Pvt Ltd, which it is using to acquire startups in the heathcare space. The home healthcare space has also seen much activity with startups Portea and Medwell Ventures raising significant private capital. This month, Delhi-based home healthcare service startup Healers At Home Ltd raised an undisclosed amount of angel funding from a clutch of investors including Fortis Healthcare's president Daljit Singh. Last month, Mumbai-based home healthcare startup Aegis Care Advisors Pvt Ltd, that operates under the brand Care24, had secured $350,000 (about Rs 2.27 crore) in its first round of funding from early stage investor India Quotient (IQ). Noida-based home healthcare services provider Health Care At Home India (HCAH India), a joint venture between the Burman family (the promoters of Dabur) and founder of UK-based Health Care At Home, is another startup in this space, which has been looking at raising funds to fuel its expansion plans. Medikoe Vesaan Technologies Pvt. Ltd.